While the world is increasingly polarized due to the recent West-Russia standoff, Russia seeks to establish a good footing with its traditional partners, while increasing cooperation with new ones, all while attempting to cancel out the hostile steps taken by the opposing camp. These collectively are the key principals of today’s Russian foreign policy. In December Russia’s President Vladimir Putin made two brief but fruitful trips to Uzbekistan and India. The former of the two can be easily called one of the most important countries in Central Asia while the latter remains traditionally sympathetic to Russia. In Tashkent, where Russia’s President stopped on his way to India, he was received by his Uzbek counterpart Islam Karimov. The arrival of such a significant figure as the president of the Russian Federation is an important even in political life of any country. But this event was particularly important for Uzbekistan as the country enters the pre-election period. On December 21 the local parliamentary elections are to be held, quickly followed by presidential elections next year. There’s little doubt that Karimov is firmly holding the reins of power, but this kind of Russian support that was showed by Putin’s visit, testified to the absence of controversy between Moscow and Tashkent. It’s also important to note that there’s a five million strong army of labor migrants from Uzbekistan, working in Russia today. While discussing a wide range of matters in Tashkent, both local and global, the presidents touched upon bilateral relations and regional security issues. The official statement issued after the meeting says that the two leaders found mutual understanding on most of the items discussed. This can be exemplified by the fact that Russia has pardoned 865 million dollars debt incurred back in the 1990s when Uzbekistan left the ruble zone, but carried on importing Russian products. Now there’s “only” 25 millions left to be paid. In turn, Uzbekistan will be increasing the volume of agricultural products it is shipping to Russia – important in the context of recent Western sanctions – and seems to be an increasingly important trend. Additionally, the two states have agreed to expand their military cooperation efforts, giving way to Russian weapon exports to Uzbekistan. In the energy sector Lukoil seems to be preparing for a long stay in Uzbekistan, ready to invest up to 5 billion dollars until 2039 in local exploration and development. The decisions that were announced at the press-conference once all the deals were signed and the ease with which Russia has pardoned the considerably hefty debt must have puzzled those circles in the West. To compromise, Uzbekistan is willing to limit its cooperation with the Eurasian Economic Union (EEC) by establishing a free trade zone. According to Andrew Kazantsev, the director of a MGIMO analytical center: “The puzzle of Uzbekistan’s inclusion in the EEC is unsolvable by its nature.” ” Islam Karimov has always been putting true independence above all other concerns in the country’s internal and external affairs. It would be naive to assume that Karimov would be willing to betray his own ways,”- said Kazantsev. However, the topic is not closed – modern history knows a handful of examples of abrupt changes in foreign policy that a country is following. It would be hard to imagine the negotiations between Putin and Karimov without them discussing regional and security issues in light of threats coming from Afghanistan. Russia has certain obligations to Central Asian countries that are preparing for accession to the EEC. Therefore, Putin and Karimov discussed gas security in southern Kyrgyzstan – that is dependent today upon the Uzbek gas supplies, so a certain agreement was reached. Another painful subject is the harsh contradiction Tajikistan has with Uzbekistan over water resources in the region. Russia has an obligation to ensure the safety of Tajikistan under the Collective Security Treaty it has signed. So it is a puzzling task to find a way out of the “water crisis”, at one point of which the Uzbek President had even said that there could be a possible escalation of the conflict. Dushanbe in its turn has been complaining for a long time about the transport blockade, which had been permanently induced by Tashkent. It seems that President Putin will be have to find a way around the rough edges to ensure the security of the region, and these first steps, it seems, have already been made. An expert on Central Asia and the Middle East, Alexander Knyazev, has called the meeting Putin held with Karimov fruitful. He believes that the negotiations they held can lead to a better understanding of the threats that Afghanistan can potentially present to the Russian Federation and Uzbekistan. Among others the two leaders highlighted terrorism and drug trafficking. Islam Karimov has even said he fears that Iraq can go down the road that Afghanistan had once taken. Obviously, he meant the emergence of the terrorist Islamic State. In this context, the presidents have stressed the extremist groups in Afghanistan are linked with those in Iraq and Syria which means that a joint effort will be imperative for effectively fighting them. It’s no coincidence that both have been mentioning the Shanghai Cooperation Organisation’s anti-terrorist center that is located in Tashkent.”- says Knyazev. Putin’s visit to Uzbekistan and India, according to experts, falls into the pattern of Russia’s turn to the East, provoked by an increasing number of attempts to isolate Russia. 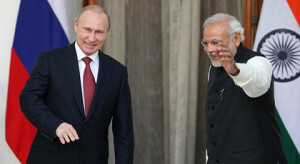 In India, Vladimir Putin was discussing Eurasian topics. There’s little doubt that India will never become a member of EEC but it can work in cooperation with it through the Customs Union. The new Prime Minister of India, Narendra Modi, seems to be focused on establishing a multi-vector policy for the country, therefore he refused to support the anti-Russian stance taken by the US and the EU. Additionally, Moscow and New Delhi have agreed that Rosatom will be building a total of 12 reactors in India. The head of Rosatom, Sergey Kiriyenko, said that “there’s going to be a difficult timetable to beat.” This Russian company has been building two blocks of nuclear power plant (NPP) Kudankulam which, according to Russia’s President, “is the sole nuclear power plant in the world that meets all post-Fukushima safety requirements”, To the delight of the local government, Moscow has decided to allow Indian companies in the exploration and production of hydrocarbons in the Arctic and in Eastern Siberia. In regard to the results of Putin’s visit to Uzbekistan and India a question can be asked – has Russia made too many concessions to their partners? Indeed, the deals seem to be asymmetrical since they are strongly favoring Russia’s partners and their interests. But such is the balance on the world stage – should some partners choose the path of confrontation and sanctions in relations with Russia, the benefits of cooperation then are granted to others.